↑ 1.0 1.1 1.2 1.3 Plait, Phil (March 11, 2011). "No, the "supermoon" didn't cause the Japanese earthquake". Discover Magazine. สืบค้นเมื่อ 14 March 2011. ↑ Hawley, John (n.d.). "Appearance of the Moon Size". Ask a Scientist. Newton. สืบค้นเมื่อ 14 March 2011. ↑ 3.0 3.1 Nolle, Richard (March 10, 2011). "Supermoon". Astropro. สืบค้นเมื่อ 14 March 2011. ↑ Ledermann, Tug (November 13, 2007). 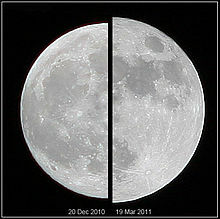 "'Perigee-syzygy' caused full moon to look bigger, brighter in October". University Wire. สืบค้นเมื่อ 14 March 2011. ↑ Paquette, Mark (March 1, 2011). "Extreme Super (Full) Moon to Cause Chaos?". Astronomy Weather Blog. AccuWeather. สืบค้นเมื่อ 14 March 2011. ↑ Byrd, Deborah (March 11, 2011). "Debunking the "Supermoon" Theory of Japan's Earthquake and Tsunami". Fast Company. สืบค้นเมื่อ 14 March 2011. ↑ "Is the Japanese earthquake the latest natural disaster to have been caused by a 'supermoon'?". The Daily Mail. March 11, 2011. สืบค้นเมื่อ 14 March 2011. หน้านี้แก้ไขล่าสุดเมื่อวันที่ 31 มกราคม 2561 เวลา 20:48 น.